Finally I decided to start updating this page. 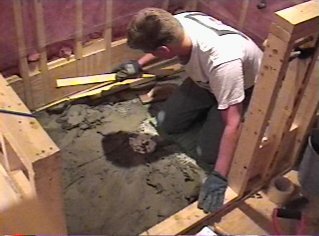 During the holiday season at the end of 2001, we did lots of work to make the bathroom functional, so I've been needing to show some progress on the site. The problem is that we took almost no pictures of the work in progress. We'll start off here with the pictures from years ago during infrastructure work, and then rapidly progress to the start of some of the finish type stuff. To prepare for the waterproof membrane that will form the sub drain for the 2" thick bed mortar, we first spread mortar around to meet the rim of the sub drain and slope up and outward from there. Blocking is installed continuously around the perimeter. 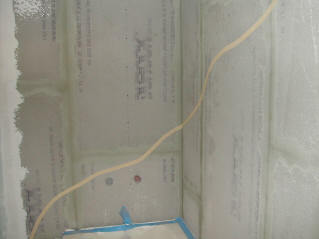 Now we're ready to cut and glue the plastic membrane. All of those scary details are in the Shower Floor Details page. Note the half walls. Both will have glass block on them eventually. 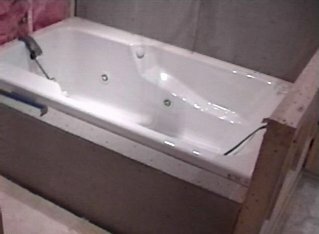 On the left is the bathtub, and on the right will be a vanity. 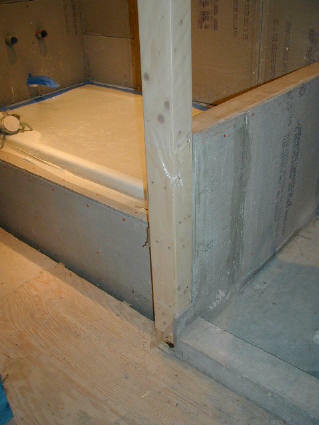 Adjacent to the shower is a whirlpool tub that is set into fresh mortar. For extra interest, I decided a front half-wall and tiny platform would be more attractive that the optional plastic front that the manufacturer sells. This will be another space I have to tile later on. Years have gone by between the last picture and this one, and I have now started to take up the bathroom construction again. 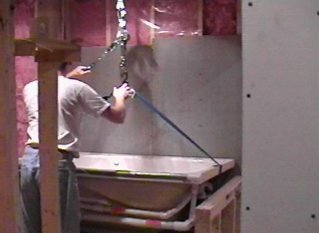 As the finish shape of what will go where takes form, I realize that to have a thick glass shower door, I'll need to hinge it to something more sturdy than glass block. So I had to take apart some of that half wall and mount a few 2X4s in as a post. I'm hoping that I can give this some sort of glass tile treatment so that it goes with the whole glass block thing and doesn't look like a badly planned post to hold up a heavy glass shower door. On a whim, I decided that the theme of the bathroom should be that you are entering an underwater cave, and the tile around the bathtub and shower should support this. I wanted the tile to be relatively dark, and especially to have natural geological "striations" just like you might see in the Northeast on the side of the highway after they blast through the granite. Maybe I'll go on a field trip and photograph some of these out on Interstate 495 in Mass. For now, use your imagination. Anyway, once I get a firm idea like this in my head, there's no talking me out of it. So, I stretched some tape around the wall to mock up a jagged edge top for the the tile section of wall and liked it immediately. 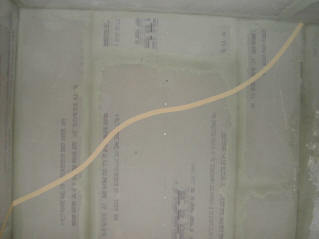 Shown here is the wall over the tub valves. 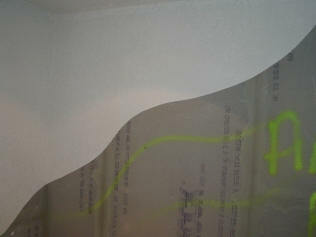 The adjacent wall is similarly treated, and the tape hits ceiling right at the beginning of the shower over the half wall where the glass block will go. The intent of the tape now is that I will finish (joint compound, texture, paint, etc) over this line, and tile under it. 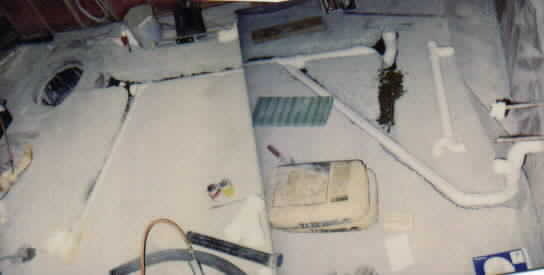 All of the drywall taping, finishing, sanding, and texturing took place in the 3 days leading up to Christmas 2001. Sometime shortly after, we thought that fluorescent graffiti might dress things up a bit. We were right. Same wall, but lower picture. I bet you're seeing what I was talking about now with the striations, right? This tiling job has consumed more time than even the curved bar top tiles, and I think it has been this single biggest time drain of the project. 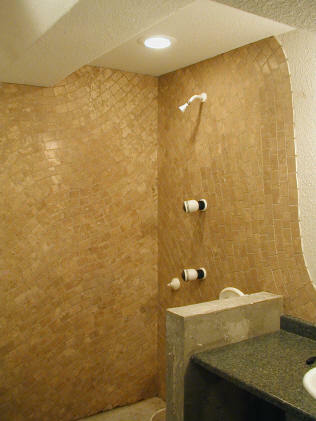 There are roughly 2400 tiles on three walls making up only 100 square feet. I don't even want to add up the hours. In case you like this and are thinking of doing something similar, click through the picture to see more details and hopefully you'll be deterred. This is reasonably current. Next project is the glass block, and then the exciting custom fused glass tiles! 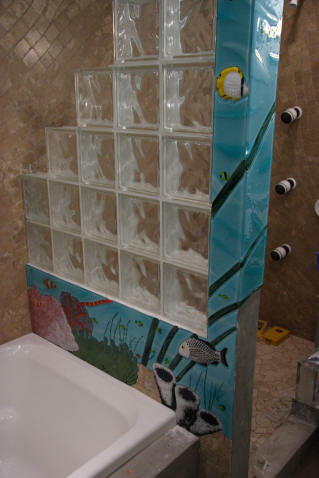 Here is a picture of the glass mural and the start of the bathroom glass block work. 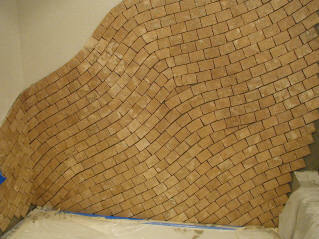 It still needs grout and finishing, but it is still fairly interesting. Click through for some close-ups of the custom glass tiles that I created.